The Hitchhiker's Guide to the Galaxy by Douglas Adams was my escape from all of the tragic news and social media debates over the past two weeks. I purchased the complete series in this ultimate guide and settled down on a rainy weekend for pure escapism, jumping into the famous first short novel, and successfully ran away from everything. My first thought, in-between bouts of giggles, was that I couldn't believe it was the very first time I've ever read this book. It's one of those realizations I wish I could go back in time and seriously tell my younger self to stop caring about who said what in school and just sit down and read this. Don't waste time, dive into the story and get ready to laugh away. 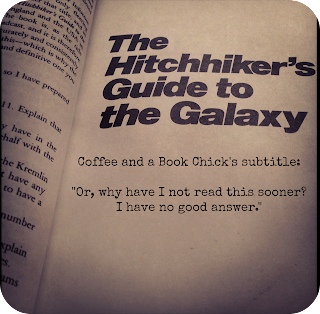 When Earth is destroyed to make way for an expressway in space, one earthling named Arthur Dent is saved by alien friend, Ford Prefect. Thrown out of one ship (I guffawed my way through the descriptions of why the poetry by aliens on that ship could result in stomach-turning moments) and then subsequently picked up by another ship, Arthur and Ford come face to... faces with Arthur's long-lost cousin, Zaphod Beeblebrox (er, semi-cousin) who happens to be the President of the Galaxy on his own mission. Riding along with Zaphod is a brilliant human woman named Trillion, a depressed robot named Marvin and a rather cheerful computer. Their eventual antics to uncover life's answers, a long-lost planet, and more, brought me to tears of laughter. 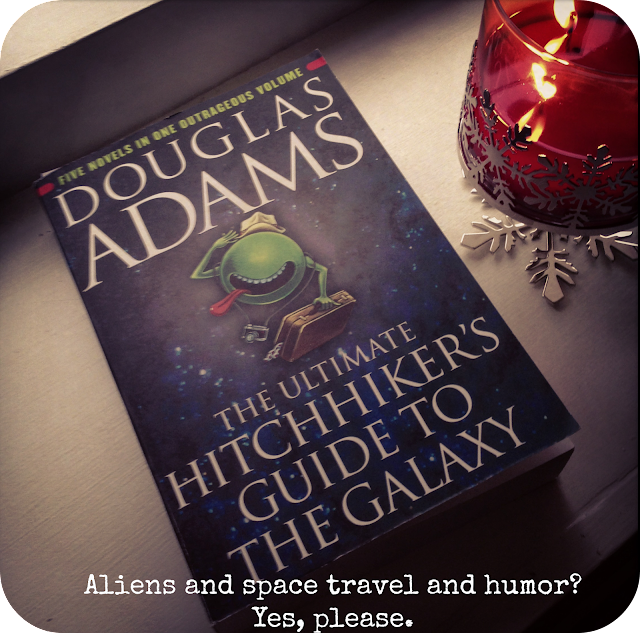 As Arthur tries to understand and bumble through moments to understand the new world he's now in, while also mourning the loss of Earth, Douglas Adams takes you through a delightful romp in space with the most hilarious moments and events that could ever possibly occur. I loved every page of the first installment. I learned about why a towel is the most important item to always carry, why "Don't Panic" is so important, and the answer, at least partially, to life, the universe and everything. I laughed out loud in several scenes and completely understood why this book is loved by many, even those who have reading interests that fall outside of science fiction. When family friends who are fans of contemporary fiction did a virtual foot stamp for me to read this, I needed no further encouragement. Thank you, my friends. This was absolutely hilarious and I cannot wait to read the rest. What I love about science fiction written thirty or more years ago is reading their versions of what life and technology will be like in the future. I'm sure it's already been covered time and again by other readers and reviewers, so this will be redundant, but I love quotes like the ones below that clearly indicate smartphones, iPads, Nooks, and Kindles. Right? Or, what about air bags? But, really, for me it was all about the depressed robot, Marvin. I can't wait to read the next installment. FTC Disclosure: I purchased this book from my local independent bookstore in Norfolk, Virginia called Prince Books. 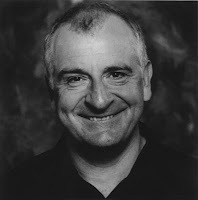 Douglas Adams is the author of The Hitchhiker's Guide to the Galaxy series which originally started off as a radio series on the BBC in 1978. More than 15 million books in the US, UK, and Australia have been sold. He died much too soon in 2001 at the age of 49. The introduction by Neil Gaiman in this collection is a beautiful tribute. Vance read this book in high school and loved it too. I too have been a long-time doubter. Maybe I'll have to finally give it a try... It does sound pretty excellent. Love this book! I vividly remember reading it for the first time way back in 1979. I still have that copy, although it's getting a little brittle. Oh my gosh! I totally have been putting this off because I saw the movie and didn't like it, but I will have to pick it up sooner! You made me want to move it up my TBR list!!! I have never read this book but it totally sounds like something I'd enjoy. I keep meaning to try this one. I should try the audio. Great review. And great escape idea. Fun quotes! Surprisingly I have never read this either, despite enjoying this kind of humor. I certainly need to some day. Part of my reason for not doing so is that they changed a major element in the film, which I like, and knowing it is not in the book makes me reluctant to read it, weird as that sounds. You should check out the film sometime, Martin Freeman does an excellent job with Dent's character. I'd also be interested in what you think about the adaptation. Feel free to link this up on the Sci-Fi Experience Review site. I can't believe I haven't read this...sigh. I even own a copy because my son read it last year. I need to get to it!! I bought a copy of HGTHG back in high school and it has sat on my shelf, untouched, for years! You have just made me pull it off! I loved the quotes you used and as usual, your enthusiasm is addictive :). Can't wait to get started! Great review :). I adore this seris and every time I find someone who's just discovered it I'm so excited that they get to read it for the first time! Although you might be used to a lot of humour, the highlight of the Hitchhikers series is the occasional deep philosophical stuff wrapped up in such a different style of witty humour. Its no wonder its in all of the top-n books people recommend. A must read, whether you are a sci-fi buff or not.